Hue Boy is very concerned about his height. Everyone thinks that he is too short. He and his mother try every possible remedy, but nothing works. Finally, Hue Boy's father returns, and Hue Boy loses his feelings of smallness through his pride of being with his father. 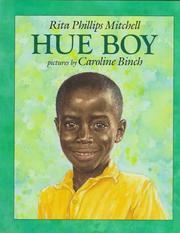 Mitchell, Rita Phillips, “Hue boy,” Children's Picture Book Database at Miami University, accessed April 20, 2019, https://dlp.lib.miamioh.edu/picturebook/items/show/6310.